A new state-of-the-art pier opened today to help commuters using a key MBNA Thames Clippers route operated for Transport for London (TfL). 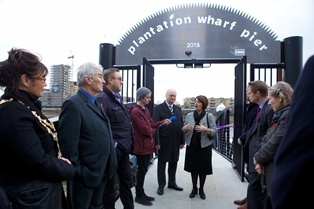 Plantation Wharf, on the Thames at Battersea, provides a much-need extra stopping point on the RB6 route between Blackfriars and Putney. It’s the 20th pier on the route. 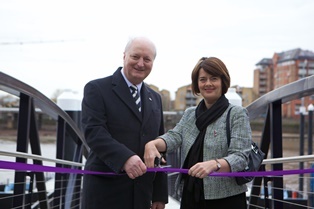 The £2.8 million structure, built and owned by Plantation Wharf Pier LLP, will offer Battersea residents a vital river link, and access to MBNA Thames Clippers’ two new high-speed boats now entering service. The 150-passenger, 35metre long ultra-high specification twin catamarans – Galaxy Clipper and Neptune Clipper – will add extra capacity to the popular RB6 route which has already seen a 40% increase in passenger journeys in the last 12 months. They will also provide extra capacity on other routes during periods of high demand. TfL recently installed pay as you go Oyster readers across all piers served by MBNA Thames Clippers river bus services, improving the experience for regular customers and visitors. In the summer of 2016, TfL will add the delivery of contactless payment for the river bus service. "This is a most exciting further advance for the western section of the river including many more people in Battersea. I am so pleased with what we have achieved jointly over the Boris Johnson Mayoralty." Galaxy Clipper and Neptune Clipper are the most technically advanced and energy efficient river and harbour fast ferries in the world. They have been designed to accommodate the unique tidal conditions of the River Thames and can cope with its low and high tidal conditions, allowing it to navigate its shallow reaches and pass under London’s famous but sometimes low bridges. The new boats boast design features such as additional roof windows that maximise opportunities to enjoy London’s iconic skyline and more room than ever to accommodate bikes. In 2014 alone, MBNA Thames Clippers passenger numbers increased by half a million to 3.8 million. In 2016 the growing MBNA Thames Clippers business is projected to carry in excess of 4.3 million commuters and visitors around London on the river.